Why you should read "Invisible Child"
A homeless shelter in Ft. Worth, Texas. A New York Times series reminds us that many of the homeless are children. If you haven't gotten to "Invisible Child" yet, and you're daunted by its length, here's why you should make time for it. "Invisible Child" is the remarkable five-part series (almost 29,000 words) that ran in the New York Times this week, about a family living in a homeless shelter in Brooklyn. A Times reporter and photographer shadowed the family—eight kids and two parents—for 15 months. It's a heartbreaking story, and a damning indictment of our nation's vast, shameful inequality. The city-run shelter the family lives in is "a place where mold creeps up walls and roaches swarm, where feces and vomit plug communal toilets, where sexual predators have roamed and small children stand guard for their single mothers outside filthy showers," Andrea Elliott, the reporter, writes. "It is no place for children," but 280 children live there—280 of the 22,000 homeless children in New York, the most since the Great Depression. 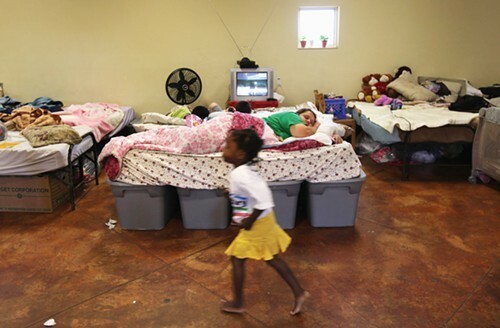 Families have languished in shelters longer in recent years. Elliott attributes this to a decline in affordable housing and in jobs that pay a living wage. She notes another view, however, voiced in 2012 by New York Mayor Michael Bloomberg: residents were staying longer, he said, because the shelters were offering "a much more pleasurable experience than they ever had before." Dasani, the central character in the series, turned 12 while the story was being reported. She is four-foot-eight and wiry, with "luminous brown eyes that watch everything." Both her mother and stepfather are unemployed and drug-addicted, so Dasani provides much of the care for her younger siblings. The bathroom in the shelter is "shared by dozens of women and girls, though men sometimes intrude." After dark, the children are afraid to use it, so they relieve themselves in a bucket in the family's room. Yet the communal bathroom "has become Dasani’s makeshift sanctuary," Elliott writes. "She sits alone in the toilet stall, the lid closed beneath her. Sometimes she reads, or just closes her eyes. Her mind feels crowded anywhere else." This isn't just a New York story. More than 18,000 Chicago Public School students were homeless last school year—an increase of 8.2 percent over the previous year. Beth Cunningham, a staff attorney for the Chicago Coalition for the Homeless, told me this afternoon that "Invisible Child" made her think "about children I've worked with who have had very similar experiences." Most homeless children aren't in shelters, Cunningham noted; they live "doubled-up" with relatives or family friends. "That doesn't necessarily mean those children's lives are more stable than the families in shelters," she said. "They often don't know how long they can stay where they are. They have to move their belongings from place to place. They may not have a bed, or access to food or regular showers." Dasani's strong connection to her school resonated with Cunningham. Dasani's principal and a teacher see possibilities in her. And considering Dasani's "home" and parents, school is crucial for her. "For children like Dasani, school is not just a place to cultivate a hungry mind," Elliott writes. "It is a refuge. The right school can provide routine, nourishment, and the guiding hand of responsible adults." "We see that so much in Chicago," Cunningham told me. "We see children who get the only stability they have from school. Sometimes it's the only place these kids get regular meals, hygiene products, clothing. When these children succeed, it's often due to somebody at school who sees something special in them. A teacher, a counselor, a security guard will notice little things—a kid showing up in dirty clothes—and will provide for them, often by reaching into their own pocket." Cunningham is glad the Times focused on a child. "When people think about the homeless, they think of somebody asking for money on the street," she said. "They don't think of those 18,000 students in Chicago's schools. Articles like this give us a more complete picture of the issue."